Strolling along the avenue parallel to the right Segre river bank we should pay attention to the noble facade of the city made up by: Montepio Building, Casino Principal, Cristòfol art gallery, Casa Melcior, the Neoclassical facade of Paeria and the one of Pal.les Building, crowned by Seu Vella. 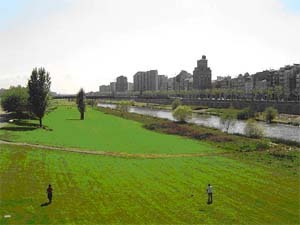 On the arrival in the city, with Seu Vella as a backdrop, we are able to see Lleida's irrigated area, the green belt that surrounds the city. Far from losing its identity, the city's irrigated area still has most of its natural peasant flavour ... and it has spectacularly adapted to the comforts of modern life. Besides, there are fifteen cycling itineraries with signs which spread over more than 300 km. This public area contains exceptional buildings, such as Café Chalet, Templet de la Música, both of which are examples of Catalan architecture from the beginning of the 20th century, and the Aquarium, a Modernist brick building decorated with glazed tiles and engraved beams. The gardens highlights are several sculptures. Mitjana is a surprising natural area that spreads on the outskirts of Lleida. It is a damp riverside area with an extension of 90 hectares and it was declared Area of Natural Interest in 1979. The most characteristic element of the area is water. Its microclimate has favoured the growth of a luxuriant river forest. Its vegetation is made up of black poplars, poplars, alders and ashes; bushes like willows, tamarisks or brambles and there is a herbaceous layer with water lentils, bulrush, reeds, yellow lilies and junks. Its fauna is another relevant feature of interest in Mitjana Park. Birds are animals that, because of their own habits, can be easily watched. In its damp parts there are many mallards, moorhens or gallinules, black-headed gulls, egrets and grey herons. Birds of prey such as harriers, buzzards and even ospreys fly above this area. Amphibians and reptiles are represented by water snakes, adder snakes, green frogs and toads. There are also many fish like barbels and pikeperch and such mammals as wild boars or foxes.